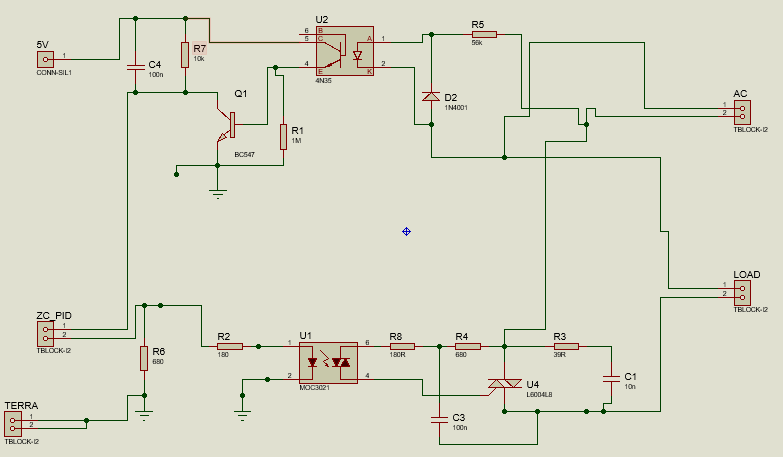 I'm doing a circuit that controls a charge for TRIAC, with zero detection. Whenever I tested the circuit, regardless of what I was sending from the microcontroller, TRIAC always sent all the current to the load. When I looked at an oscilloscope for the detection of zero, I realized that it only detected zero once in a complete wave (not two). I researched the component I was using and noticed that the 4N35 only has one LED, so since I was not rectifying my wave before, it was only detecting the positive part of the wave. In my country, i have 220V and 60Hz for AC. My question is: how can I change my code to control TRIAC by detecting zero only on the positive side of the wave? It is possible? With this code by now, when i send 128, it simply lets the wave pass completely, and when I say 2, for example, the output wave goes out all "wrong", without following the AC wave. There is no need for tricky software. Figure 1. Replacing D2 with a bridge rectifier will turn on the opto-isolator on both positive and negative mains half-cycles. Your 59k value for the current limiting resistor, R5, seems suspiciously low. You should check your calculations for this and the power rating. Most carbon or metal-film resistors are only rated for 200 V or so. Your 220 V mains will peak at \$ 220 \sqrt 2 \ \text V \$ so it is usual to use two series resistors to make up the required value. Figure 2. A second 4N35 could be piggy-backed onto the existing one. Note that the LED terminals require a cross-over. Triacs cannot be turned off through the gate. You can turn off the gate current but the Triac will only turn off itself as soon the holding current through the MT1-MT2 terminals passes the (current-)zero-crossing. 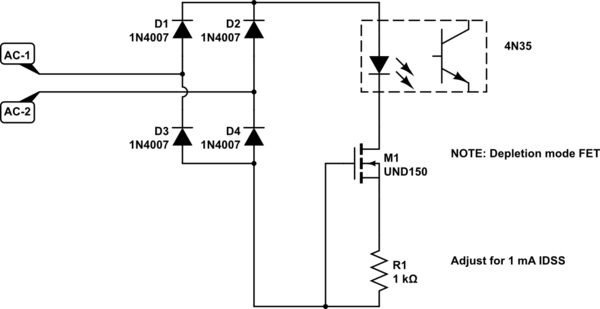 Wait 100µs so the Triac could react to the gate current. Firstly there is nothing conceptually wrong with the circuit you have designed even though it only signals during the positive half cycle (there are however lots of practical problems with it). The leading edge of your MCU signal is close to the zero crossing (x volts after it) on the positive half cycle and the trailing edge is close to the zero crossing (x volts before it) for the negative half cycle. You could set up an interrupt to allow you to respond to either the 0-1 transition or the 1-0 transition into your MCU. The biggest problem with your design is the very low operating currents you have chosen to set, which makes the design less than ideal. Consider that for your design, Q1 needs to sink 500 uA (plus some unknown current to pull the MCU signal low, which I'll ignore), and that will require about 5 uA base current at the minimum Hfe of 100. The C-E current for the 4N35 is therefore around 6 uA. At this low current the CTR of the 4N35 is very low and likely only of the order of 0.1, so about 60uA of LED current required. This will mean the AC input voltage will be at about 4.5 V. This might be an acceptable voltage level for detection, but it will be very temperature sensitive and corrupted by the time it takes to charge C4 at these insanely low currents. I'd challenge you to go through your design again and try to predict the trigger voltage required on the AC line over a temperature range of just 0-30 degC and with a range of BC547 and 4N35 characteristics. It won't be a nice picture. With this type of detection you get the same trigger level for both positive and negative half cycles, and the trigger is always just after the zero crossing. You then only need to detect a single edge if you use interrupt detection. Not the answer you're looking for? Browse other questions tagged triac zero-crossing or ask your own question. How to sense the zero crossing of current? How to account for input noise on a zero crossing detector op amp?